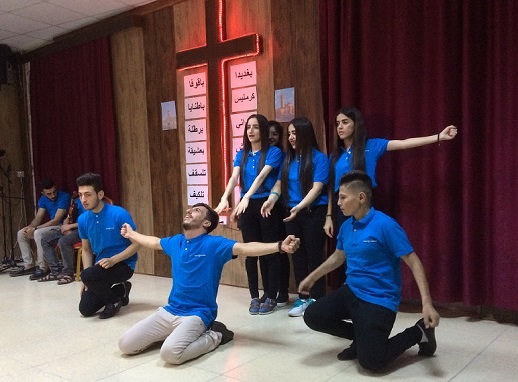 At this memorial service, young people performed their own poetry, made music and danced in front of a cross, around which are the names, in Arabic, of the villages still under IS control. It’s been two years since thousands of Christians fled their homes in Mosul and the Nineveh Plains to run away from the advancing armies of the so-called Islamic State. But now, as Iraqi forces plan to retake Mosul, the Christians are praying they will soon be able to return home. Iraqi Christians in Internally Displaced People (IDP) camps across the country held prayer services and other memorial events throughout the weekend to mark the “Black Day” on 6-7 August, 2014, when IS took several towns surrounding Mosul, such as Qaraqosh. Martin was a young assistant to his priest as a new IDP from Karamles, whose story World Watch Monitor reported in 2015. In a video-interview at that time, Martin said how he’d had the chance to leave for the US but chose to stay to serve his community. Now, about to become one of the two official priests of the Karamles camp, Martin had the idea to suggest that his fellow IDPs gather in their families for “Pesach” meals. This meal, first eaten by the Israelites the night they fled Egypt after all Egyptian first-born sons were killed in the last of the plagues, has become the weekly Jewish “Seder”. It commemorates the way that the spirit of death “passed over” every Israelite home because its doorpost was daubed with a sacrificed lamb’s blood, as well as God’s provision while the Jews wandered in exile. 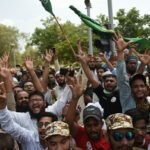 The parallel with the way the Christians had to flee the Nineveh plain, amidst the arrival of “N” signs daubed on their doorways two years ago, was not lost. “God has been with us all the time, He has protected us from direct violence and led us out just in time,” said Martin. “Even if we don’t live in our own village, we can live out our faith here, be a loving community and a light for our surroundings. Of course we want to go back to our houses, unlock the doors and start rebuilding. 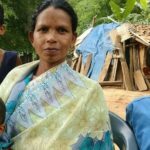 Martin and his fellow IDPs have started a campaign. On every door surrounding the square, there’s a sign – “Liberate Mosul” – and there are many more throughout the city, as other Christians have followed his lead. 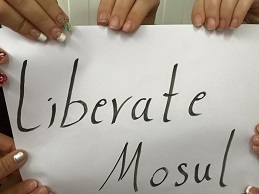 They are encouraging others to make their own “Liberate Mosul” posters and to share them via social media, using the hashtag #Liberate_Mosul. A photo exhibition of the refugees’ first six months away from their homes. Martin said the campaign isn’t only a tool to raise awareness for the outside world; “It is also a motivator for us to not just sit around and be sad, but to become active and start rebuilding here, change our lives according to God’s will and show society where our hope comes from”. 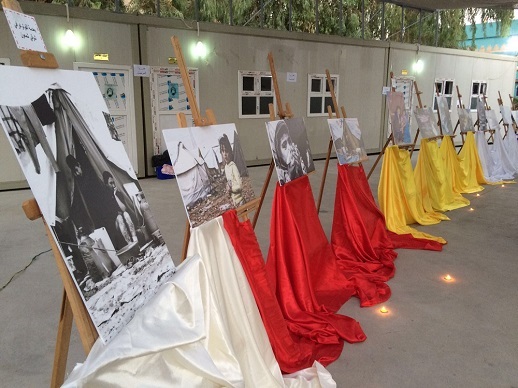 Other commemorations took place across Iraq’s many IDP camps, including one where young people performed their own poetry, made music and danced in remembrance of how good life was “at home”, while another event included a photo exhibition of the first six months away from their homes. Meanwhile, the European Syriac Union (ESU) said IS’s “massacre” of Christians in the Nineveh Plains was a repeat of a massacre, 81 years earlier, to the day, of the 7 August, 1933 Simele Massacre at the hands of Iraqi forces. On that day, it says, 3,000 civilians were killed. Eighty-one years later, noted the ESU, history was repeated as “IS took control of the historical homeland of Chaldean-Syriac-Assyrian[s] in [the] Nineveh Plains”. The ESU called it a “massive genocidal destruction of Chaldean-Syriac-Assyrian people [and] their millennial cultural, historical and religious heritage … by demolishing churches, monasteries and historical sites”. “There is a historical and moral responsibility,” ESU added, “for Iraq, [the] regional and international community … to stand with the vulnerable groups, recognize genocides against them and support them by accelerating the liberation of [the] Nineveh Plain and supporting safe zone, autonomy in the region which will open the way to self-administration. Read more: Do Iraqi Christians need an autonomous province of their own?